Your Daily Cute: Two Cats Tuesday: We May Have Too Many Toys! Well, it's officially out of control. Pimp and Moo have too many toys and they've outgrown their old toy basket... so I got them a new, bigger, better (and much neater) one! Believe it or not, there is a basket under there somewhere! Here's Pimp with his bigger and better toy basket! Look how happy he is! Moo likes it, too. 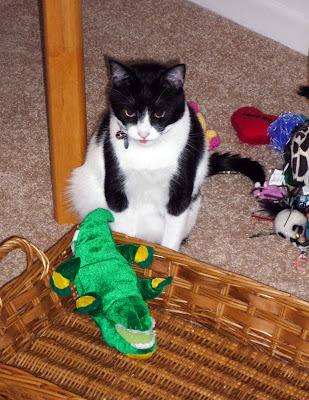 You can tell because he brought it his favorite gator. He drags this thing around the house and puts it on things he likes... like my clothes or his favorite rug. So, since both boys approve, it was time to transfer all the toys (man, there are a lot of them!) to their new home. We have been needing to do this for a long time! Just look how much better that is! All of them actually fit IN the basket! 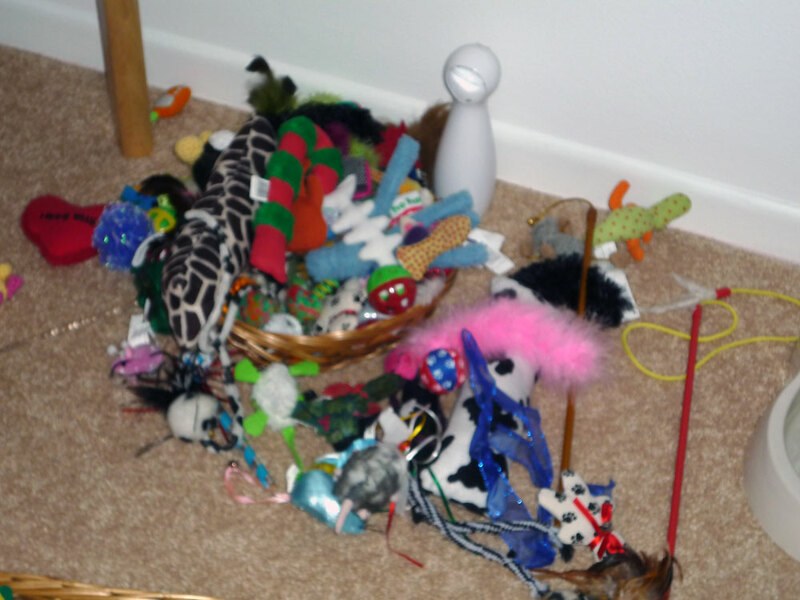 Well, except for the stick toys, but Moo will drag those somewhere else in a few minutes anyway. Hehe. And the final seal of approval?? Pimp picking out a toy! I just love when he picks out a toy. It's so darn cute. He digs around in there with his nose looking for just the right one, then puts da bitey on it like one of those claw machines and pulls it out. I'll have to video it one day for you all! Hehe - that's sooo cute! 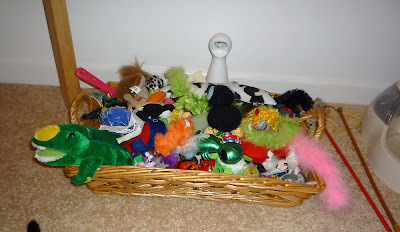 I had similar problems with all of my dog's toys - ended up with two laundry baskets full - one for the stuffed plush toys, and one for plastic, rubber, squeakies, tennis balls, frisbees lol (yes she was extremely spoiled!, and she was with me a long time, so we had many years to accumulate a lot) - and she too would root around in the baskets for just the right toy! 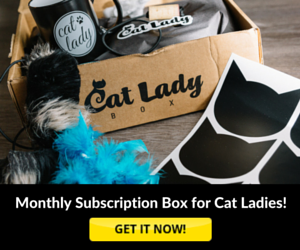 Your kitties are obviously very well loved, and very happy! Harley does the same thing, sticks his head into the toybox and roots around for just the right toy. In the morning, there are toys scattered everywhere! Can't wait to see the video of Pimp picking out a toy! WOW - dat's a whole lotta toys. Dat's so cute how Moo picks out his toys out of the basket. No met, I expect me peeps to drag out a couple and then help me play with it!! Notice, I said "help" me play with it. Our assistant needs to do the same thing. Our toys are all over the place including under the stove and fridge. So we will tell her to just get organized. Have a great day. Pimp and Moo, you are looking good. Adorable. I have to hide the toys and rotate them here. Otherwise my cats get tired of them. So the toy box is in the wardrobe! They are just so cute! I can't wait for the video of Pimp picking out his toy. 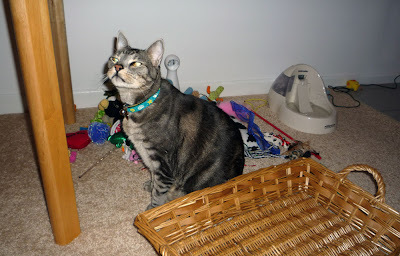 This is how all humans should think: when there are too many cat toys... get a bigger toy basket! don't hit me but I actually think you STILL need a bigger one! MOL! Whoa! They do have a lot of toys. Don't show the Farm cats or they might revolt! There is no such thing as too many cat toys! We think the basket is a great idea. Our mom has our toys in rotation - she stores about half of them in a big plastic jar with catnip in it, and we are always very interested when she brings out our "new" toys. I agree with Mishkat, nope, never too many, never, never ever! What a great new toy basket! We gotta toy basket too...we like pulling all the toys out right after mom puts them all in! *Tap, tap, tap, paw* AHEM. BZTAT, Pimp and Moo have a cool basket. Why can't WE have one too??? 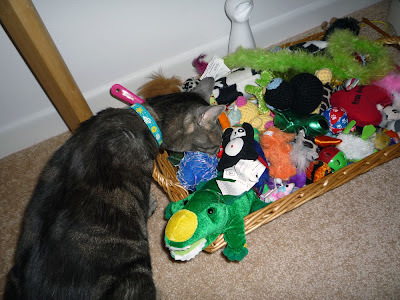 We have had that problem too - we don't think you can have too many toys though, just too small a toy basket! My girls have a giant toy basket, too. They rotate pretty efficiently, though!